Our educators occasionally conduct professional development trainings for formal K-12 classroom teachers. Public school teacher training programs serve as opportunities for enriched learning and reinforcement of crucial lessons. The Coastal Federation’s educators are experts in teaching about watersheds and the importance of the estuary through hands-on techniques. Working jointly with is the N.C. Center for the Advancement of Teaching (NCCAT), a state-funded facility on Ocracoke Island, where the Coastal Federation has been implementing both education and restoration work since 2010. NCCAT is a recognized national leader in professional development programming for teachers with an additional campus facility in Cullowhee, North Carolina. The weeklong cross-disciplinary seminars allow teachers from across the state to immerse themselves in a wide range of experiential studies and return to their classrooms recharged with energy and resources. 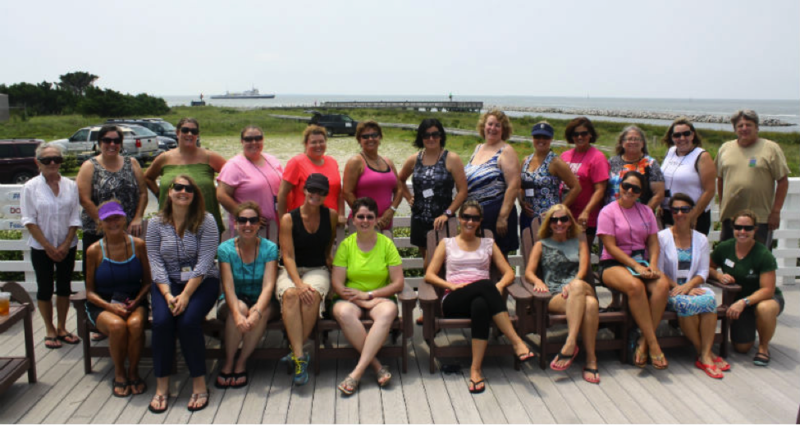 The Coastal Federation has used these teacher workshops as opportunities to spread their mission, not only to teachers on the coast but also as a way of integrating coastal science knowledge and supporting activities into classrooms across the state. Traditionally the Coastal Federation has participated in science-based seminars at NCCAT, using the living shoreline restoration project on-site for tangible learning. In fact, the first ‘Planet Wetlands’ seminar participants (2010-2011) played a major role in accomplishing major restoration activities to repair the shoreline. By planting thousands of marsh grasses (20,000 actually) and spreading oyster shells, they were able to learn while doing. They helped transform the shoreline that was once highly eroded into a flourishing, stable marsh, while developing new lesson plans to take back to their classrooms and to be able to share this unforgettable process with their students. This living shoreline has grown into a productive and successfully restored site and the project continues to serve as an outdoor classroom that the Coastal Federation incorporates into a variety of professional development sessions.